(Courthouse News) – Researchers have discovered the fossils of two new species of ancient saber-toothed predators that will help illuminate a key period in the early evolution of mammals. (Undark) IN JANUARY, I stood in a ditch in the middle of nowhere in South Africa, and the summer sun beat down as I stared at a heap of grape soda-colored rocks. Bob Gastaldo, the paleontologist whose research team I had been following through the Karoo, had his back turned and was busy striking these quarter-billion year-old rocks — residues of a mass extinction that caused about 70 percent of all land life and 96 percent of all marine life to vanish permanently — with his hammer. The extinction has a few names. One of them is the Permian-Triassic (PT) mass extinction, for the two geologic periods it separates; another is the “Great Dying,” for all the life-ending change it caused. It is the biggest extinction of the so-called “Big Five” mass extinctions that punctuate the history of life on our planet, and, according to many researchers, one of the best places to see the PT land extinction as it exists in Earth’s many-layered rock record is in the Karoo, a vast, semidesert region of south-central South Africa. Where I stood in that ditch, the extinction horizon — that is, the point where the rock layers go from Permian to Triassic in age — is supposed to be somewhere amid the rocks that were in front of me. If some of these rocks were gravestones, you would see names like Diictodon and Daptocephalus — names of land animals that missed the train to the Triassic. Near the ditch, Gastaldo had tripped over the fossil skull of what was probably a Lystrosaurus. 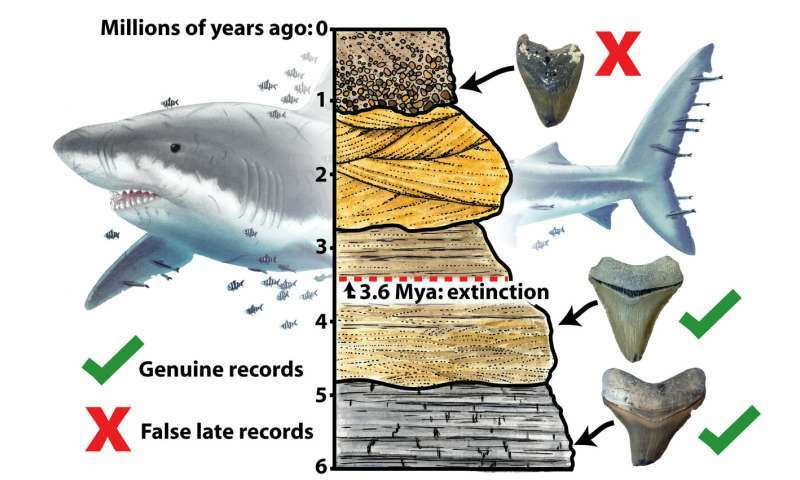 Other paleontologists, including Roger Smith of the Iziko South African Museum in Cape Town, believe the extinction of land animals suggested by these rocks coincided with a massive die-off of marine life. “It happened on land and it happened in the sea and it happened at the same time,” Smith told me. Then, as life reset itself, new species appear above the boundary. Sandra Kamo, a geochronologist from the University of Toronto, hopes to determine the absolute ages of these rocks, which would make it clear when the land extinction happened. Fossils - General News and Discussion was really a good idea for a thread. I am having fun sharing articles on this general topic. (Courthouse News) – Organisms on Earth about 600 million years ago did not suddenly grow large because they were fighting for more food, but because they were trying to propel their offspring farther into the world. Research suggests real estate was a prime driver in the first expansion of complex organisms on Earth, according to a study by the University of Cambridge released Monday. 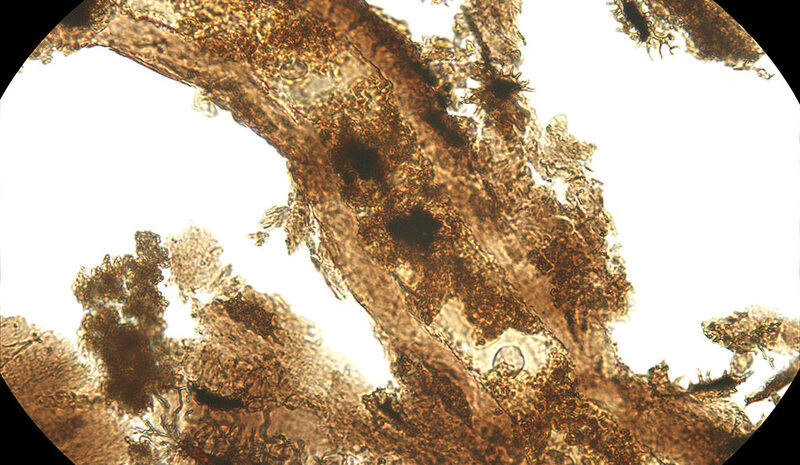 Between 635 and 541 million years ago, life on earth was microscopic. But during the Ediacaran Period the first complex organisms began to appear on the ocean floor. Long before any life could crawl, walk, fly or swim there were stationary rangeomorphs, which resembled a plant frond with stem-like structures that are believed to have gathered nutrients from the water around them. One hypothesis is competition in the frond community led to innovations with rangeomorphs’ stems and they outgrew the rest of the microscopic life around them. Rangeomorph fossils show that some of the largest organisms grew to at least 6 feet tall. Artist’s impression of rangeomorphs, fern-like organisms that lived during the Ediacaran Period. (Science) The fallow deer was about 6 years old when it died about 120,000 years ago on a lake shore in Germany. Its skeleton, recovered by archaeologists and belonging to the extinct species Dama dama geiselana (a different member of which is pictured above), shows an 11-millimeter, circular wound at the top of its pelvis, right next to its spine. But the hole (pictured below) doesn’t look like it came from a fight with another male or the tooth of a carnivore. No, this particular injury could only have been made by a human tool during a hunt, scientists say. And the only human species in Germany so long ago was the Neanderthal. Archaeologists have discovered ancient Neanderthal spears in both the United Kingdom and Germany, but they weren’t sure how these hunters actually used them. Did they throw them at their prey from long distances? Or did they chase down the animals and stab them at close range? Now, scientists have recreated the 1.8-meter-long spears used by Neanderthals in Germany 300,000 years ago and attacked modern deer bones with them. They found they couldn’t make the kind of injury found on the 120,000-year-old skeleton by throwing the spears. Rather, they had to thrust the weapon upward at the animal’s hip while standing close to it, the researchers report today in Nature Ecology & Evolution. This suggests Neanderthals hunted at close range. (Fossil News) The Pliocene outcrops are quite abundant in Belgium. Local Pliocene is usually referred to as the “Scaldisian”, by reference to the Latin name “Scaldis” of the river Schelde (in Dutch, “Escaut” in French) near which Pliocene outcrops are encountered. Located in the north of the country, these sandy layers may be observed at the top of clay quarries in small cities like Steendorp, Sint-Niklaas and Tielrode. But the type location of the “Scaldisian” is to be seen in building sites and on sandy plains in the Antwerp harbour area. Like most big cities in Belgium, Antwerp possesses a Dutch name, “Antwerpen”, and a French name, “Anvers”. It can be rather confusing for people coming from outside the country who try to reach the city. Antwerp is a nice town and is also world-renowned for its diamond trading, but that is another story. If you are interesting in buying diamonds, Beyond4cs.com would be a great website to start learning about diamonds. During the Miocene period, the Antwerp area was a gigantic gulf where sea currents pushed around the carcasses of dead sea mammals like whales, seals, and dolphins. When these decomposed, isolated bones fell to the bottom of the sea. Such an amazing amount of flesh attracted hungry scavengers like sharks, which lose some of their teeth while feeding. At the beginning of the Pliocene Epoch, erosion eliminated an important part of the Miocene sands. The “hard parts”, i.e. small stones, fossil bones, and teeth, were concentrated in great numbers at the bottom of the Pliocene rocks. Together with green sand, this made up what is called here a “base gravel”. Later the glauconitic sand partially condensed into sandstone pebbles; the best proof is the black stones containing a reworked shark tooth or vertebra. Finally more and more sand layers were deposited, some of them containing rich mollusc assemblages or many cetacean bones. In the harbour area, different Pliocene outcrops may be observed, but now these will almost never occur in situ. The best time for finding Antwerp fossils was during some docks digging work fifteen years ago, when Pliocene sands that were extracted from docks were accessible to amateur collectors. But do not despair; nowadays it is still possible to find first-class fossils in displaced remnants which can be found in the vicinity of these docks. (New Scientist) They will remain forever locked in mortal combat. The Velociraptor has sunk its deadly foot claw deep into the neck of the herbivore, a boar-sized creature called Protoceratops. This vicious attack may have hit the carotid artery – a lethal blow. What happened next? One possibility is that a sand dune collapsed on them while they were still fighting for their lives. Norell thinks heavy rains had destabilised the dune, so it flowed quickly and smoothly over the pair as they fought. Elsewhere in Mongolia, he says, animals have been found trapped in their burrows by similar flows. (Courthouse News) – Scientists at the Natural History Museum of Utah on Thursday revealed the discovery of fossils belonging to a bony-tailed dinosaur with armor-like skin that walked the earth 76 million year ago. Paleontologists at the museum said they’ve unearthed fossils belonging to Akainacephalus johnsoni. The medium-sized, herbivorous dinosaur evolved from a line of dinosaurs called anklosaurids which lived in Asia and western North America during the Late Cretaceous Period. Walking on four legs and using leaf-shaped teeth to eat plants, the dinosaur also had a large mass at the end of its tail which was used for crushing things and for self-defense. Akainacephalus lived during the upper Campanian stage of the Late Cretaceous Period, which spanned from approximately 84 million to 72 million years ago. Akaina comes from the Greek word for spike or thorn while cephalus comes from the word for head. The museum said it took almost four years to fully prepare all of the fossils for display. Museum volunteer Randy Johnson helped put the fragments of the skull together, and now is the dinosaur’s namesake. Scientists believe the dinosaur Akainacephalus johnsoni. recently discovered in Utah, evolved from ancestors in Asia. A beautifully preserved fish tail from Jurassic limestone in Germany (approx. 150 million years old). Even the patterning has been preserved. 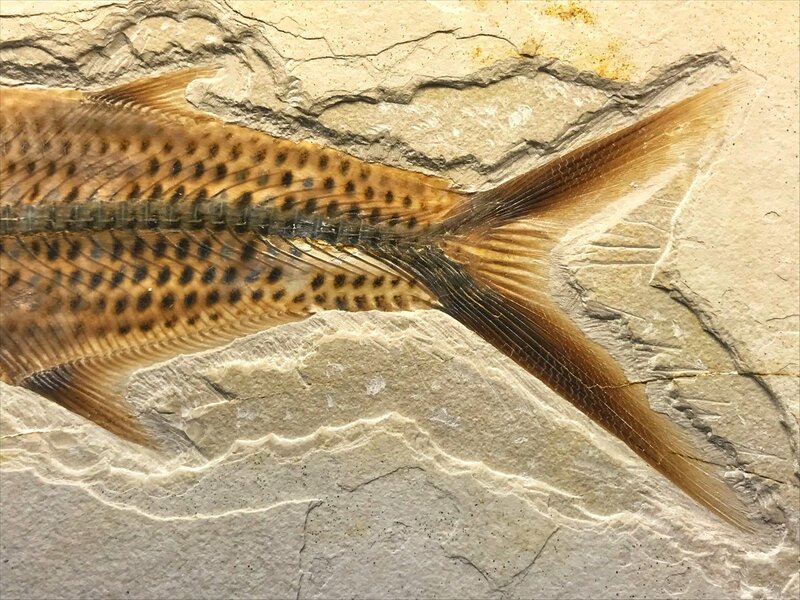 (Courthouse News) – Bony ray-finned fish with sharp teeth nibbled on other fish in the sea about 150 million years ago, according to researchers who say the newly discovered piranha-like creature presents the earliest evidence of fish feeding on other fish. Sporting triangular teeth with serrated cutting edges on the inside of their lower jaws, these Jurassic-era fish were found in limestone deposits next to some of their victims – other fish with nibbled fins, according to researchers who published their findings in scientific journal Current Biology. The piranha-like fish were discovered in modern-day southern Germany and unlike the modern piranha, these distant cousins swam in the ocean and grabbed their food on the go as they stealthily ate the fins of other fish. The now extinct flesh-eating fish – named Piranhamesodon pinnatomus – swam in the ocean while small dinosaurs roamed the earth. Their fossils are now part of the natural history exhibit at Jura Museum in Eichstätt, Germany. The fossil of a newly discovered piranha-like fish from the Jurassic period. It likely used its sharp pointed teeth to feed on the fins of other fish. "We found most of the cranial bones: the snout, the jaws, a lot of teeth, also the bones that define the eye sockets for example and, in that way, we were able to create an almost complete reconstruction," said Jose Luis Carballido, a researcher at the Egidio Feruglio museum and the national council of scientific investigations. "Not only is this the discovery of a new species in an area where you wouldn't expect to find fossils, but the skull is almost complete," added Carballido. 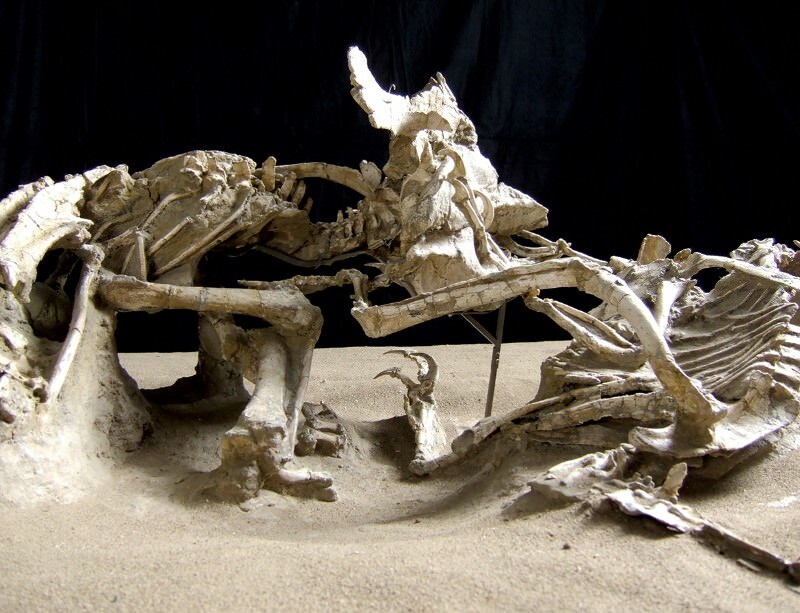 The remains belonged to an adult of around 12 meters (39 feet) in length, and two minors of around six to seven meters. Burnt toast and dinosaur bones have a common trait, according to a new, Yale-led study. They both contain chemicals that, under the right conditions, transform original proteins into something new. It's a process that may help researchers understand how soft-tissue cells inside dinosaur bones can survive for hundreds of millions of years. Fossil soft tissue in dinosaur bones has been a controversial topic among researchers for quite some time. Hard tissues, such as bones, eggs, teeth, and enamel scales, are able to survive fossilization extremely well. Soft tissues, such as blood vessels, cells, and nerves -- which are stored inside the hard tissue -- are more delicate and thought to decay rapidly after death. These soft tissues are composed mainly of proteins, which are believed to completely degrade within about four million years. "We took on the challenge of understanding protein fossilization," said Yale paleontologist Jasmina Wiemann, the study's lead author. "We tested 35 samples of fossil bones, eggshells, and teeth to learn whether they preserve proteinaceous soft tissues, find out their chemical composition, and determine under what conditions they were able to survive for millions of years." The researchers discovered that soft tissues are preserved in samples from oxidative environments such as sandstones and shallow, marine limestones. A new kind of giant dinosaur has been described in Russia. Dubbed Volgatitan, the herbivore belonged to a family of long-necked dinosaurs called sauropods. It weighed 17 tons and walked the earth 200 million to 65 million years ago. The enormous dinosaur was identified from seven of its vertebrae, which had been stuck in a cliff for 130 million years until they were discovered on the banks of the Volga river near Ulyanovsk in 1982. ..."
The bones sat for 20 years until they were re-examined by Averianov. ..."
“[After] checking the literature when I returned home, [I] confirmed that this is a new taxon of titanosaurian sauropods,” Averianov recounted. A taxon refers to a specific group. Titanosaurs were the last surviving group of the giant long-necked dinosaurs and were some of the largest land animals known to have lived. It was previously believed that Titanosaurs’ evolution took place mainly in South America in the Early Cretaceous before some taxa migrated to North America, Europe and Asia in the Late Cretaceous. However, this new discovery in Russia shows that Titanosaurs were more widely distributed in the Early Cretaceous and that some of their important evolutionary stages may have happened in Eastern Europe and Asia. Weighing in at 17 tons, Volgatitan’s not even close to being the largest titan of the Titanosaurs. “The largest members of this lineage reached 50-70 tons, but they lived much later, in the Late Cretaceous period,” Averianov explained. “Volgatitan is one of the oldest titanosaurian sauropods which lived in the beginning of the Early Cretaceous period, some 130 million years ago. More than 85 well-preserved dinosaur footprints—made by at least seven different species—have been uncovered in East Sussex, representing the most diverse and detailed collection of these trace fossils from the Cretaceous Period found in the UK to date. The footprints were identified by University of Cambridge researchers between 2014 and 2018, following periods of coastal erosion along the cliffs near Hastings. Many of the footprints—which range in size from less than 2 cm to over 60 cm across—are so well-preserved that fine detail of skin, scales and claws is easily visible. The footprints date from the Lower Cretaceous epoch, between 145 and 100 million years ago, with prints from herbivores including Iguanodon, Ankylosaurus, a species of stegosaur, and possible examples from the sauropod group (which included Diplodocus and Brontosaurus); as well as meat-eating theropods. The results are reported in the journal Palaeogeography, Palaeoclimatology, Palaeoecology. Pterosaurs, those flying reptiles that soared over the heads of dinosaurs, have long been depicted with scaly skin and bat-like, hairless wings. But a new study paints them as far cuddlier creatures than we might have thought. According to an international team of palaeontologists, pterosaurs were covered in no less than four different types of feathers, pushing back the origin of this bodily covering by about 70 million years. A prehistoric sloth fossil was found Saturday in Argentina. General Alvarado Municipality in Miramar said in a written statement that a family walking in Mar del Sur shore in the country's east. Miramar is located on the Atlantic Ocean. The Palvecino family called the Miramar Punta Hermengo Museum when they found the fossil. Initial analysis showed the jaw of the sloth called Scelidotherium, estimated to live roughly 700,000 years ago. Now extinct, a Scelidotherium's weight was more than a tonne (2,204 pounds) and has a long skull. It is estimated that this species has giant claws to allow it to dig huge holes. (Nature) The remains of Indigenous Australians — taken from their resting places after European colonization — could now be returned, with help from ancient-DNA sequencing techniques. In a 19 December paper in Science Advances, researchers showed that they could accurately match DNA from ancient Aboriginal Australian remains to modern inhabitants from the same geographical area. The research could enable the repatriation of the hundreds, if not thousands, of Indigenous Australian remains in museums that lack documentation indicating their origins. 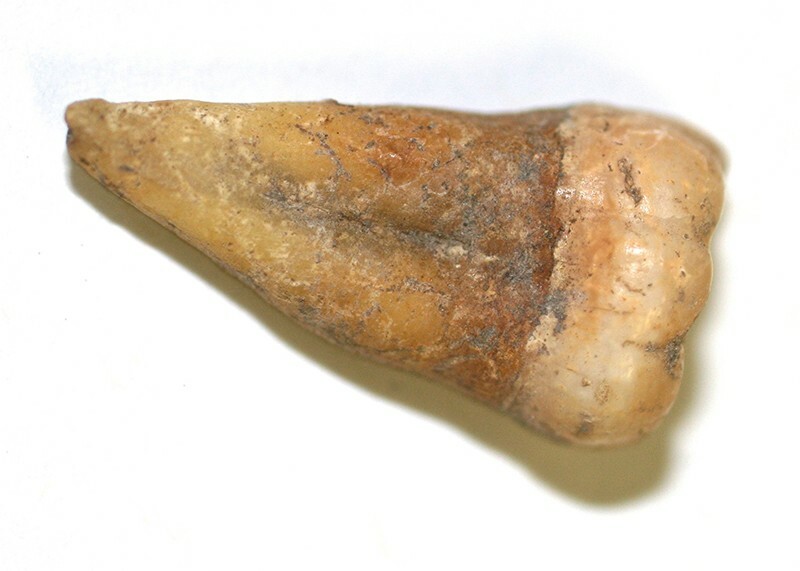 Ancient DNA was obtained from a 700-hundred-year-old human tooth that belonged to Aboriginal Australian remains found in New South Wales. A "hidden cradle of plant evolution" has been uncovered in Jordan. In Permian sedimentary rocks exposed along the east coast of the Dead Sea, a team led by palaeobotanists from the University of Münster discovered well-preserved fossils of plant groups bearing characteristics typical of younger periods of Earth history. The Permian began some 300 million years ago and ended around 250 million years ago. The researchers present their findings in this week's issue of Science. (Nature) How an animal moves can tell scientists a lot about how it lives. That is how researchers hope to learn more about an ancient crocodile-like creature called Orobates pabsti. Orobates lived before the dinosaurs. It is known as a ‘stem amniote’ — an early offshoot of the lineage that led to ‘amniotes’, namely birds reptiles and mammals. Using 3D scans of an exquisitely preserved Orobates fossil and an associated set of fossilised footprints, researchers built a dynamic simulation. The simulation also incorporates data from extant animals such as lizards and salamanders to constrain the movement. The researchers then tested their simulations in the real world using a scale-sized robot. Bringing Orobates back to life. ﻿Start your own investigation into Orobates movement here. Archaeologists have discovered the grave of the English explorer who first circumnavigated Australia, and who helped name it. (Phys.org) Megalodon—a giant predatory shark that has inspired numerous documentaries, books and blockbuster movies—likely went extinct at least one million years earlier than previously thought, according to new research published Feb. 13 in PeerJ—the Journal of Life and Environmental Sciences.